Why do we only offer one bottom? Because sometimes one is all you need. Constructed with all Italian fabrics and chamois, the Pro+ is offered in both bibs and shorts and in male and female-specific fit and chamois. The Italian MITI Shield fabric is engineered to hold color while under extreme compression - meaning they won't become see-though when you put them on. OPTIONS: Male & Female-specific fit & chamois; Long & Short inseam; bibs and shorts; Adventure race side pockets; Hi-Vis ink (+$10). Available in 4 base lycra colors (between the legs and up to the belly) - black, red, green, and navy. 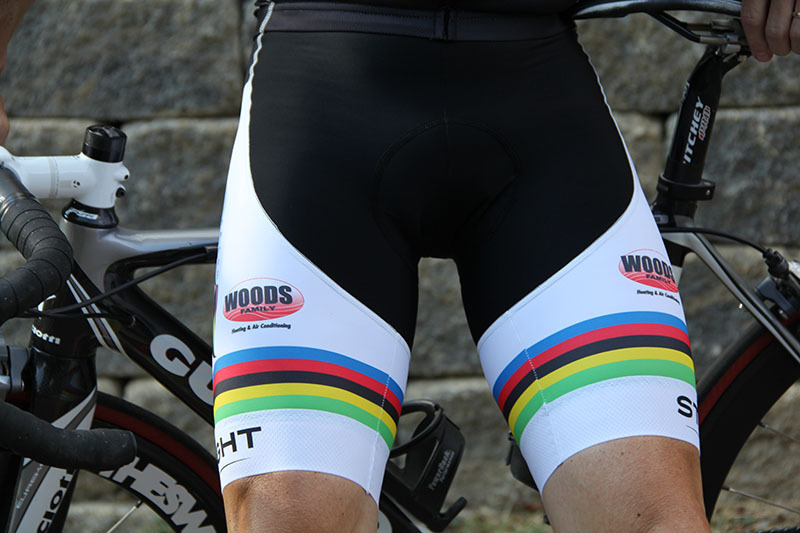 The Pro+ bottoms are available as bibs or shorts in two inseam lengths. Generally we make the shorter inseam for women and long inseam for men. You can't mix inseam length within gender to get the same quantity price but it's no problem to split the length between genders in the same order. Long inseam pictured. The length is added in the printed leg panel just above the power band. The power brand does not have print restrictions. The silicon-infused laser cut power band is attached with our exlusive zigzag stitch. This prevents that binding "rubber band" feeling at the leg. The Pro+ bibs have been ridden and tested at some of the biggest races in the world.